On July 3rd, 1989, David Mineer Sr. collected a building permit from the Utah County building permit office, and Construction Monitor was born. 28 years later Construction Monitor has a data collection network spanning 1,899 jurisdictions throughout the United States and provides the most real time building permit information in the country. Construction Monitor now has thousands of clients relying on that accurate and up-to-date weekly information to grow their revenue and help make crucial business decisions. 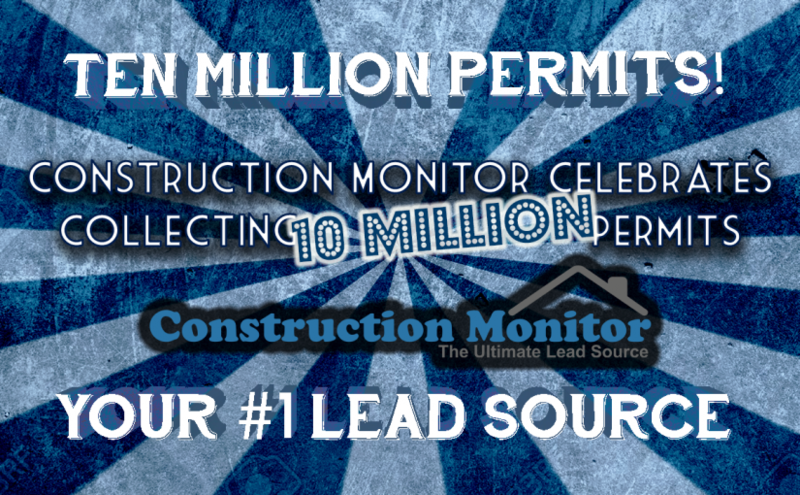 On May 9th, 2017, Construction Monitor entered the 10 millionth permit into its database. The 10 millionth permit was collected from Richmond, Virginia. It is a commercial remodel permit with a valuation of $1,095,000 that was issued on April 21st, 2017. Subscribers to Construction Monitor; such as companies in the drywall, flooring, security, and solar industries, will be able to use that permit as a potential opportunity to generate bids and create more revenue. Since 1989, Construction Monitor has created over 10 million of those types of opportunities for its clients. Building permits are valuable as both sales leads and statistical information because they are required on every construction project from a small residential remodel up to a commercial high-rise. With multiple ways to contact most individuals related to millions of construction projects, Construction Monitor clients have been able to identify and capture opportunities that they had only because they watched permits through Construction Monitor.